My favourite paths are those which run right along the water race, covered with small smooth stones. They are collectively called Dog-Paths. 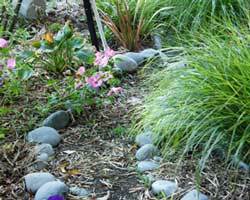 The water sparkles and shines, and so many different types of plantings are enhanced by being near running water. 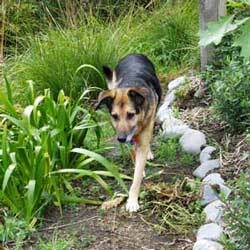 A Dog-Path is by definition a path designed by a dog, and as a consequence can be reasonably narrow. Taj-dog, the first Moosey dog, was a streamlined labrador-alsation cross with a narrow probing nose, and did not require width. People, however, do, and some of the Dog-Paths that he created are very tricky to negotiate. Trying to keep things looking natural, any clumps of rushes or Phormiums by the water's edge were accommodated. The ground sloped towards the water, so I had to use an an axe to chop through tree roots to get the Dog-Path level. I then built little stone retaining walls to hold back the garden - this was a slow hard job. To 'design' the very first Dog-Path I watched Taj-dog heading off through a new garden by the water race and just copied his route. This original Dog-Path is still in use, and runs from Rooster Bridge past a large Wattle tree. It then drops down to the very edge of the water race where Taj-dog would have a drink. Original plantings of Japanese Irises, Hostas, spotty Ligularias and Astilbes still survive here. These foliage plants are happy near the water, in the partial shade of the Wattle tree. The path used to continue along water's edge, and then climb gently past a row of Hebes to reach the first of the grass areas, known as Duck Lawn. But, alas, the amount of the water in the race increased, often putting the path's middle section under water. Too sloshy and muddy! Now one end curves back through the garden, while the other stops at a wooden garden bench. The second Dog-Path started life running all the way from Middle Bridge upstream towards the Plank. I covered it with little stones, and it was wide enough for a wheelbarrow. The small stone retaining wall which defined the garden fascinated Taj-dog, who was always nosing into it and dislodging stones. I planted tussocks on the stone edge, trailing rosemary, and clumps of spring daffodils and tulips to be seen and enjoyed from the top floor house windows. Oops. 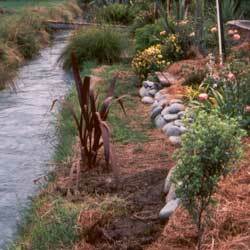 I also planted the Phormium hybrid Yellow Wave at the start or the Dog-Path, by the bridge. 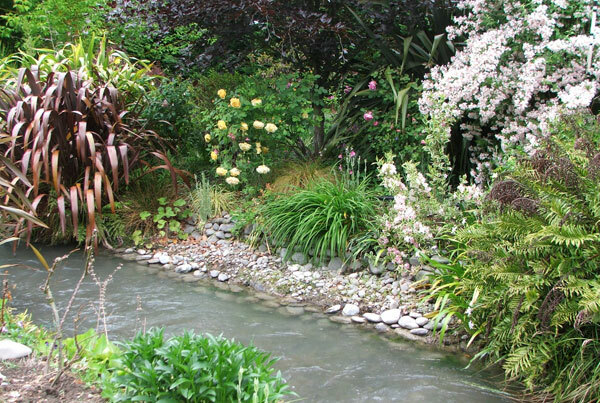 This soon became far too bulky to walk around, without the danger of the gardener tipping into the flowing water. This Dog-Path quickly changed in design and purpose. When first built it stopped by an upright dark red Phormium, deliberately planted at the very edge of the water - you can see how tiny it was in this archive photograph. 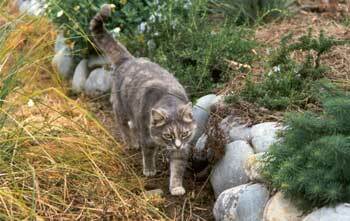 The human path-wanderer was then ushered up some little steps and through the garden. 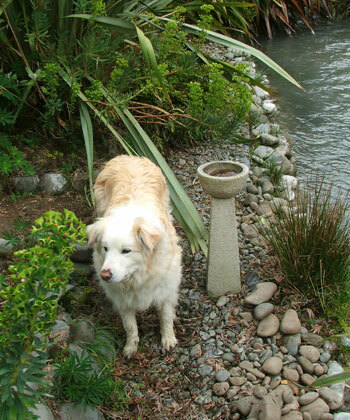 Taj-Dog, however, would just ploughed on through, brushing the side of the Phormium. Thinking that dogs have great path design sense, I followed his example, and made the Dog-Path wiggle around the offending Phormium (this took me and my axe ages) and along the water, to emerge gracefully underneath a small tree (a much admired Cercis Forest Pansy). But when both the red Phormium and the tree bulked out too much, this Dog-Path extension was well and truly blocked. So it reverted to its original endpoint, with fragrant roses to enjoy and a small Dog-Path seat to rest on.